Gold medalist Rhys McClenaghan of Northern Ireland celebrates after winning men's pommel horse event during the artistic gymnastics men's apparatus final. 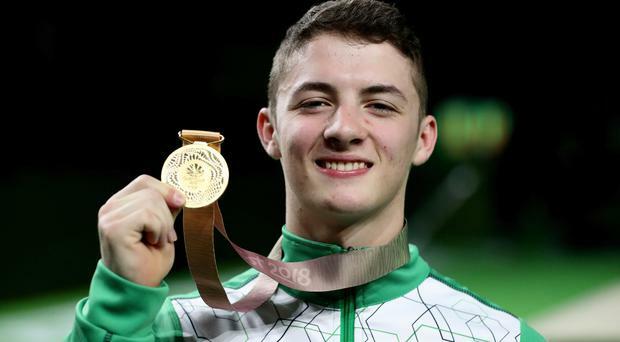 Three cheers for young Rhys McClenaghan from Antrim who has won the first gold medal for Northern Ireland at the Commonwealth Games. He narrowly defeated Max Whitlock, the Olympic champion, in the men's pommel horse and thereby wrote himself into the long list of our distinguished local sporting heroes. Rhys said he always felt that one day he would be "up there with the best". He has just proved his point, and at the age of only 18 it is certain more glory days lie ahead. His victory at the Commonwealth Games will inspire other competitors from Northern Ireland. These faraway games are close to our hearts.